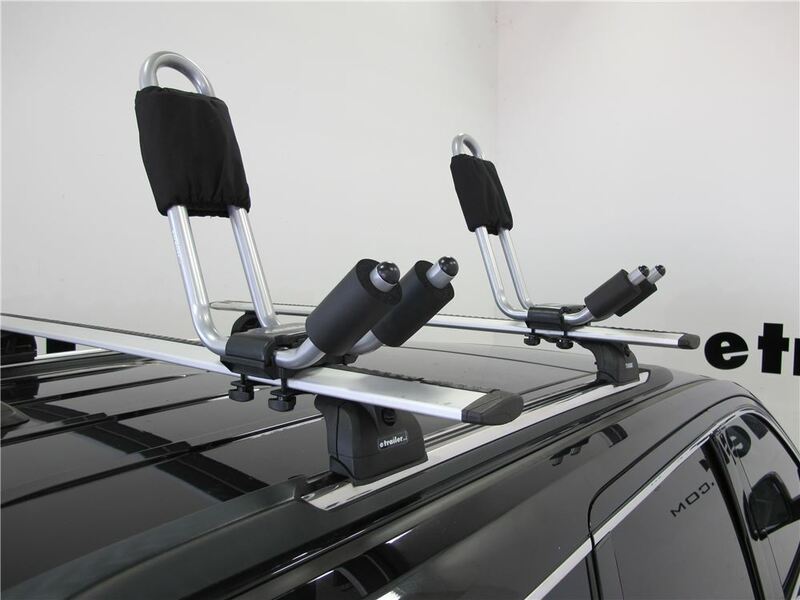 These J-style cradles let you transport 1 kayak on its side on your roof-rack crossbars. Compact and easy to install, the design won't take up too much space on your roof. 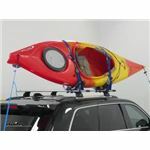 And tie-down straps are included to secure the kayak to your crossbars. 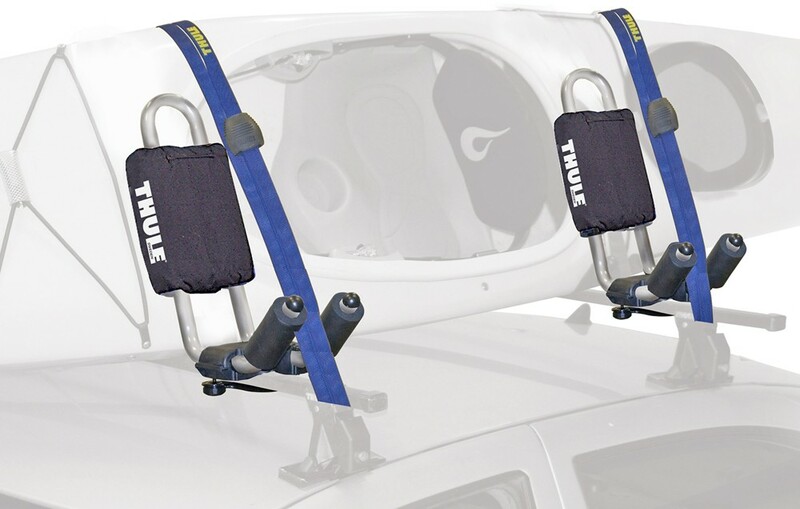 Lowest Prices for the best watersport carriers from Thule. 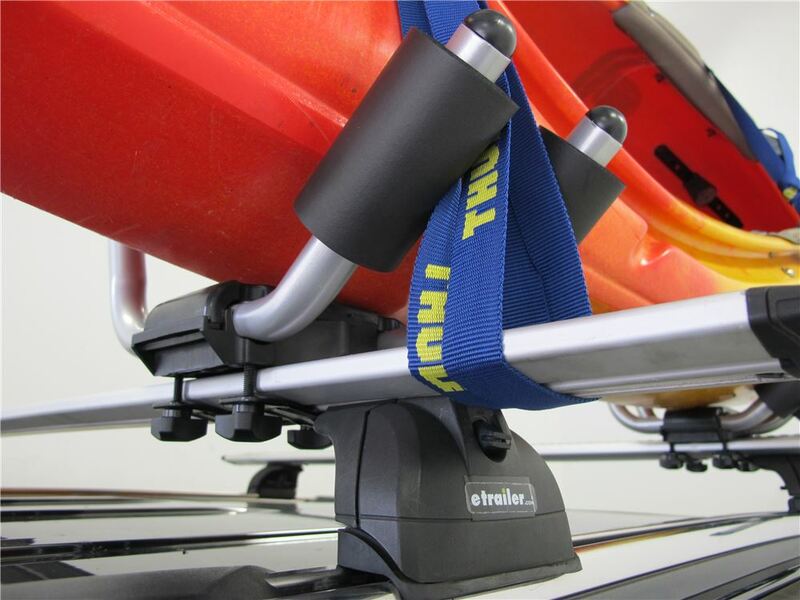 Thule Hull-A-Port Kayak Carrier w/Tie-Downs - J-Style - Fixed - Side Loading part number TH834 can be ordered online at etrailer.com or call 800-298-8924 for expert service. 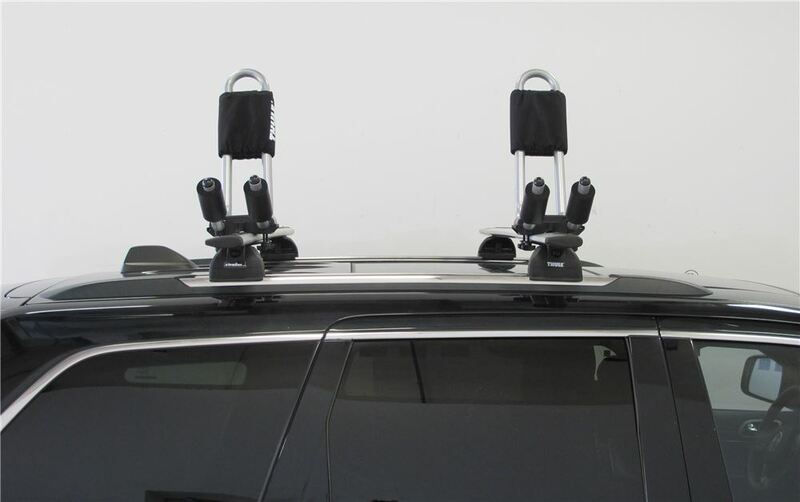 Kayak enthusiasts will appreciate the simplicity of the Thule Hull-A-Port - an inexpensive, easy-to-install solution for transporting your watercraft on your roof-rack crossbars. 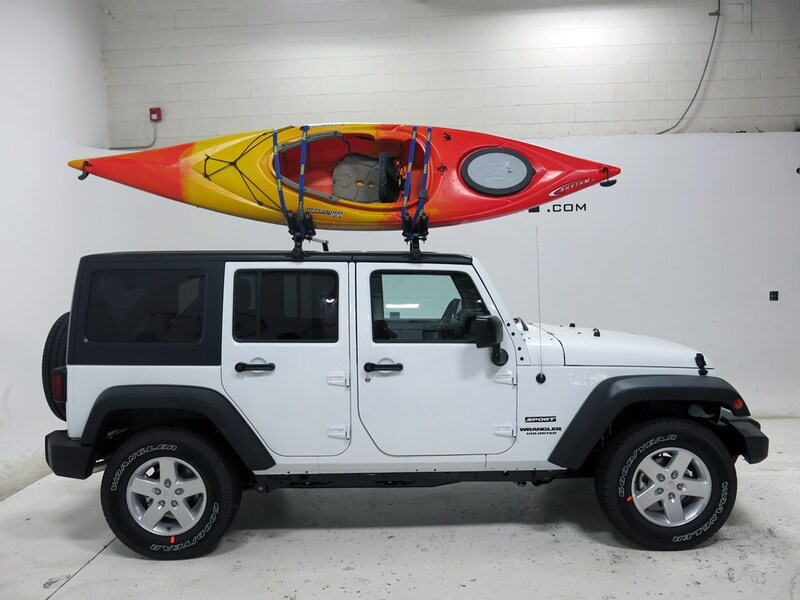 With a wide profile capable of holding a kayak up to 36" wide, these J-style cradles make it easy for one person to load and unload a kayak. 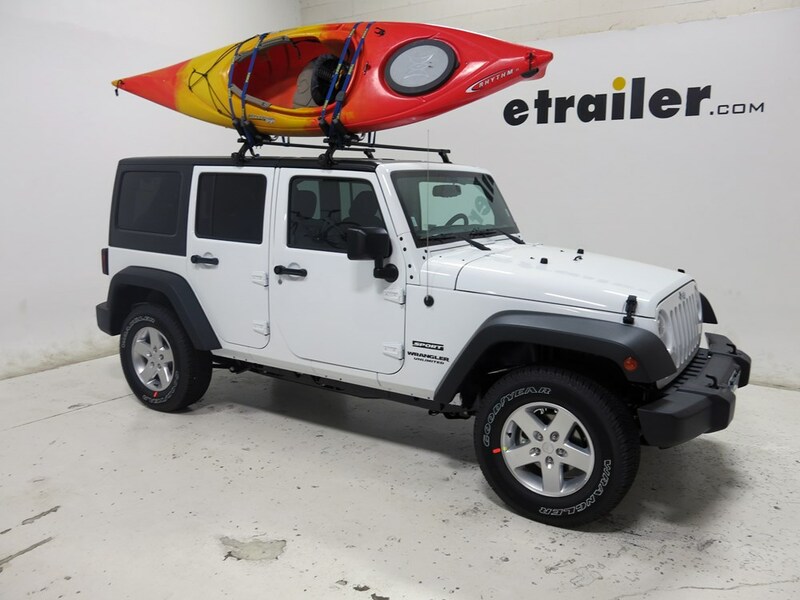 And since the cradles hold your kayak on its side, it takes up less room on your crossbars than saddle-style carriers, leaving plenty of space for you to carry more gear. 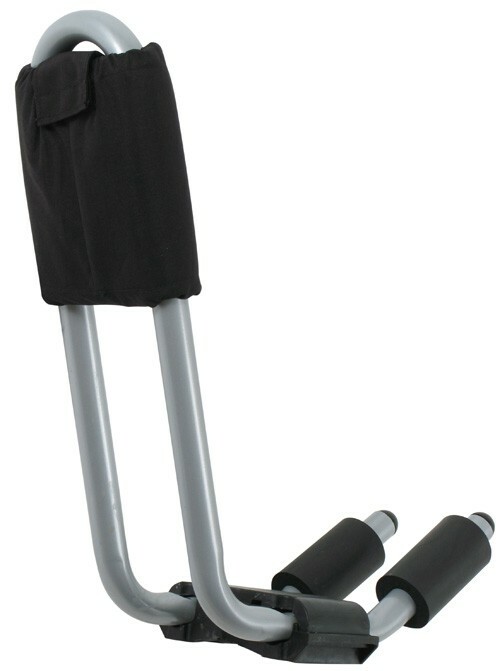 The Hull-A-Port fits most crossbar styles with the included universal mounting hardware. 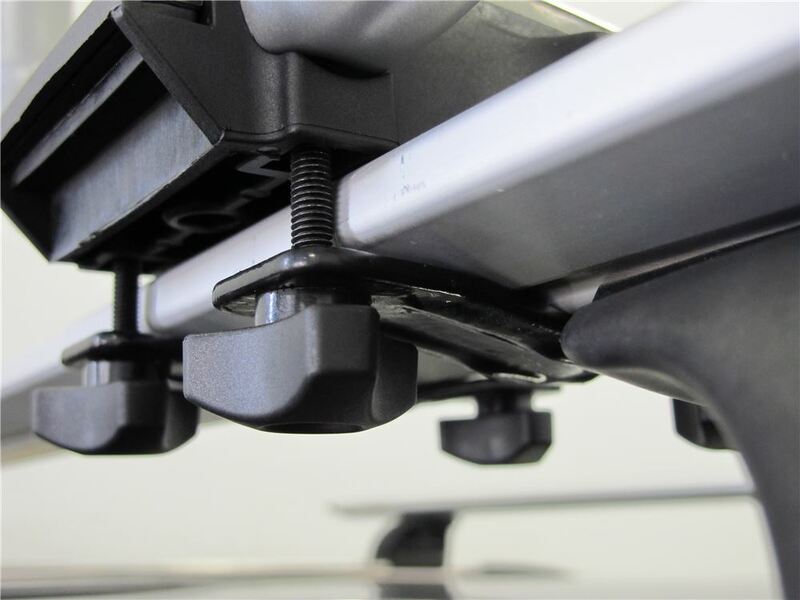 These brackets and hand knobs tighten around your crossbars in seconds for a simple, hassle-free installation. 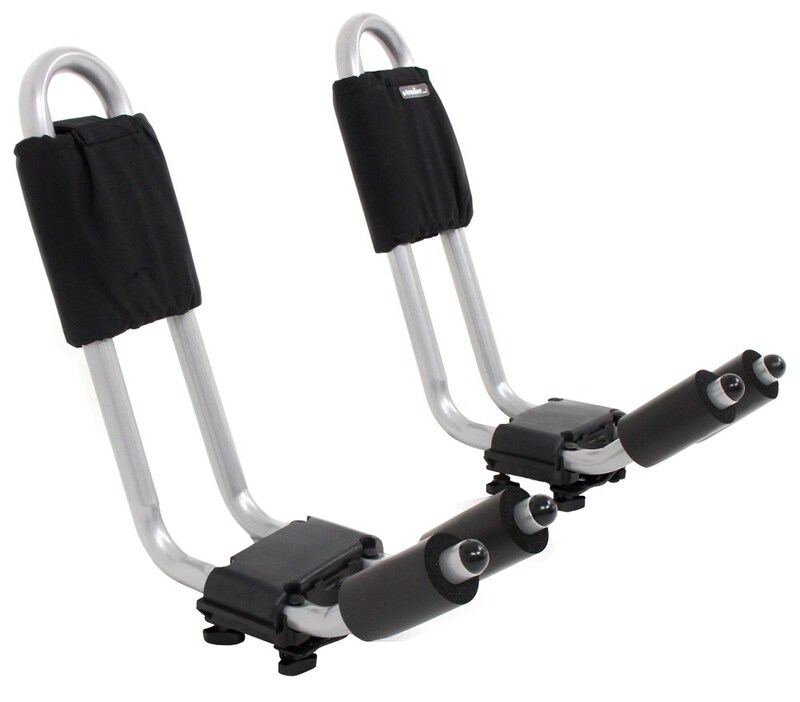 The J-style cradles include adjustable pads that slide up and down the upright arms. 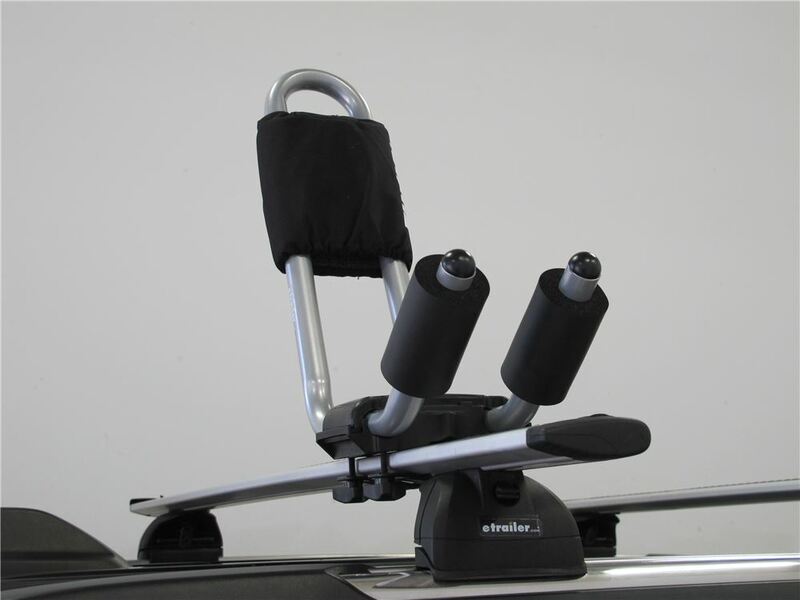 This allows you to customize the position of their four touch points to better support your kayak. These pads strengthen the cradles and protect your kayak's hull from scratches and abrasions. 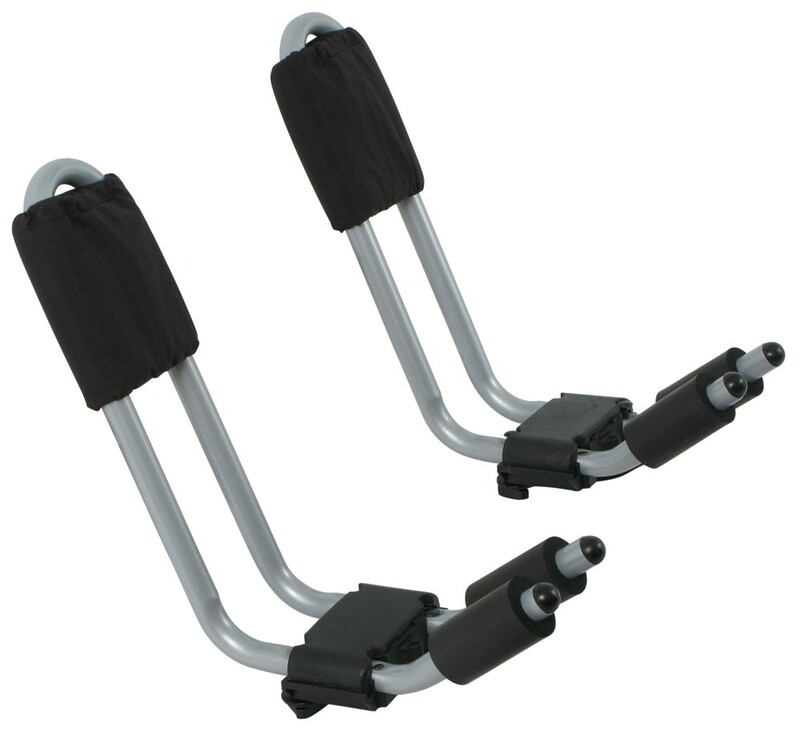 Two tie-down straps with padded buckles are provided for you to strap your kayak to your crossbars. 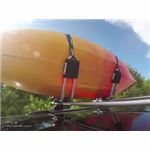 And a set of bow/stern tie-downs also is included to anchor the front and back of your kayak to your vehicle. 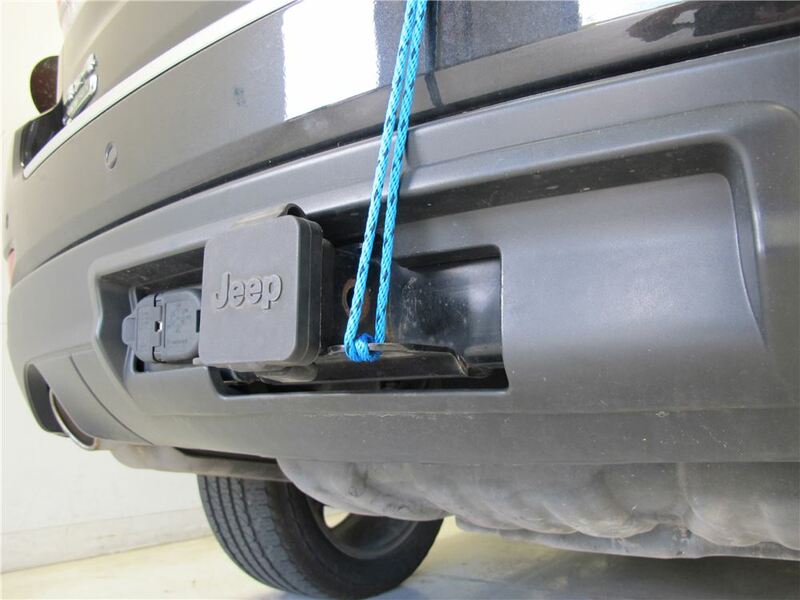 Typically the bow/stern tie-downs will attach to the bumpers or hitch on your vehicle. 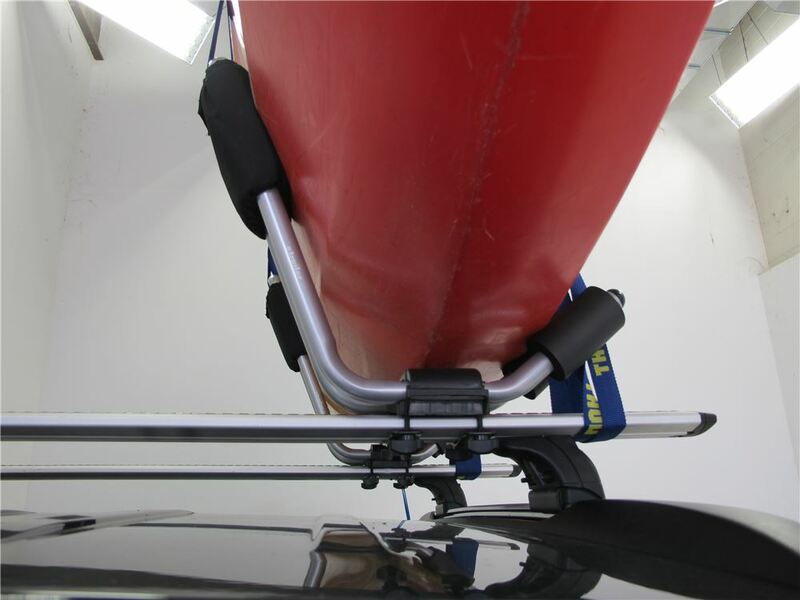 Adapters are available to make it easier to attach the bow/stern tie-downs. The Hull-A-Port is constructed of steel tubing with a rust-resistant AllSurface coating that ensures durability. Speaker 1: Today we're going to be taking a look at the Thule Hull-A-Port. 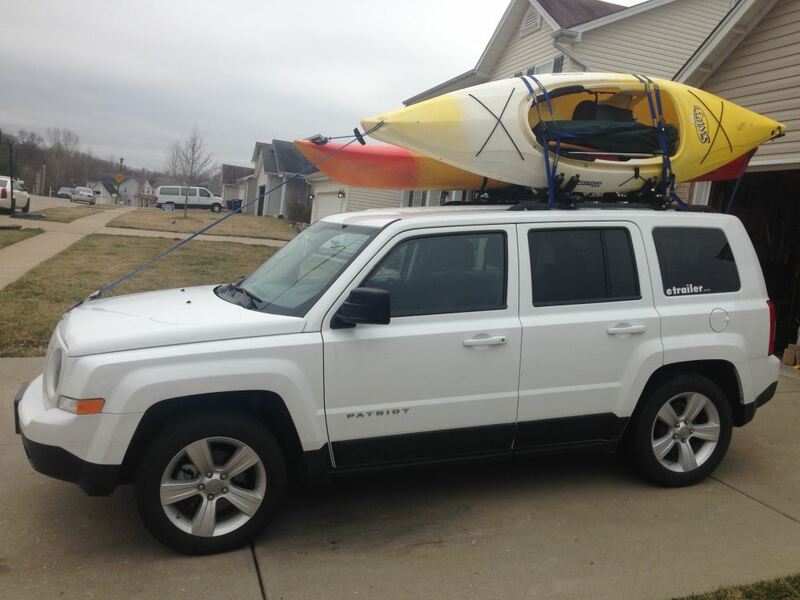 This is a J style, fixed, side loading kayak carrier with tie downs. Part number is TH834. 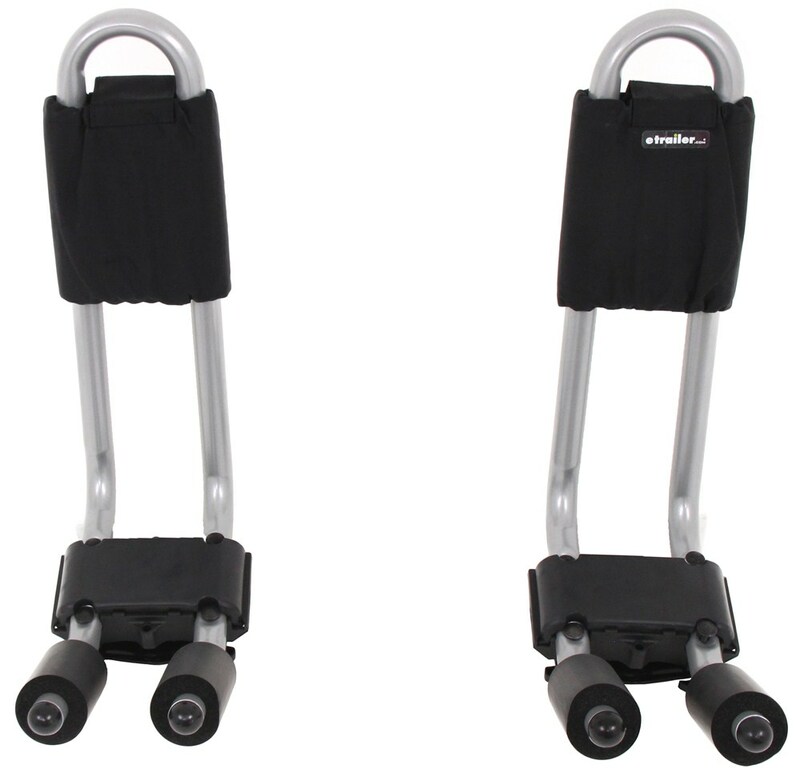 Now with its simple, sturdy design, the Hull-A-Port receives a lot of great customer reviews. Reading through there, they talk about how sturdy it is, how it handles highway speeds with no real issue or movement, and just overall, customers remain very satisfied with the design.Now the Hull-A-Port's going to be a single J hook style kayak carrier. It's very straightforward and simply designed, but very, very effective. As you can see, our kayak's really nice and secure. We've got plenty of padding around . which we'll take a look at in a minute . 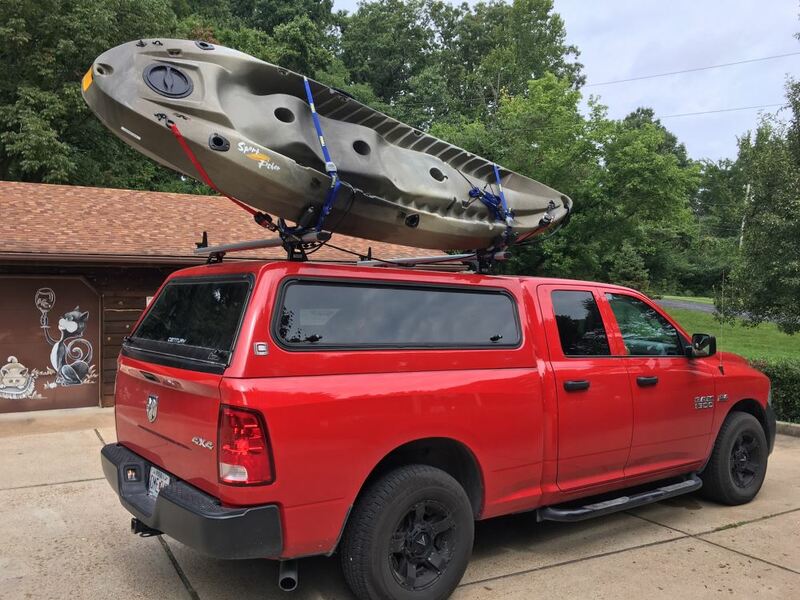 to keep our kayak protected, so it's really, really good bang for the buck.It has a smaller design as well. 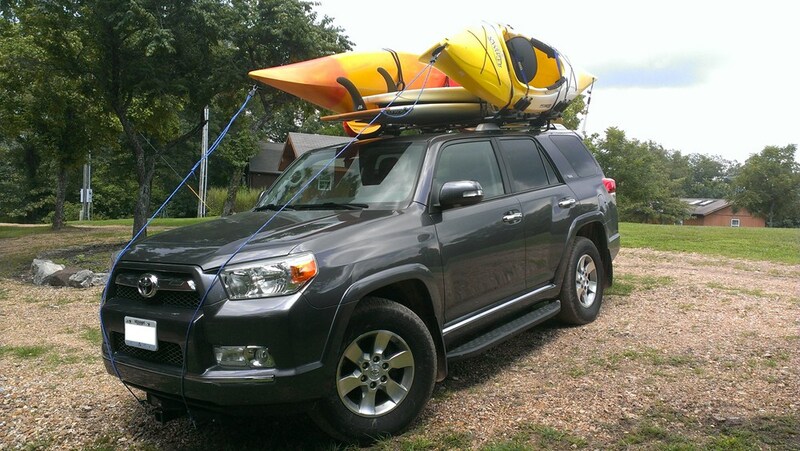 It's not going to be one of the very big large style kayak carriers. it sits right down here on the top . we've got a really nice rubber pad. This not only is going to give protection against scratching and things, but it also helps to absorb some of the shock and things we get as we head down the road. If you look at the front side here on the J portion of our hooks, you can see the really thick foam pads. Again, just offering some protection. 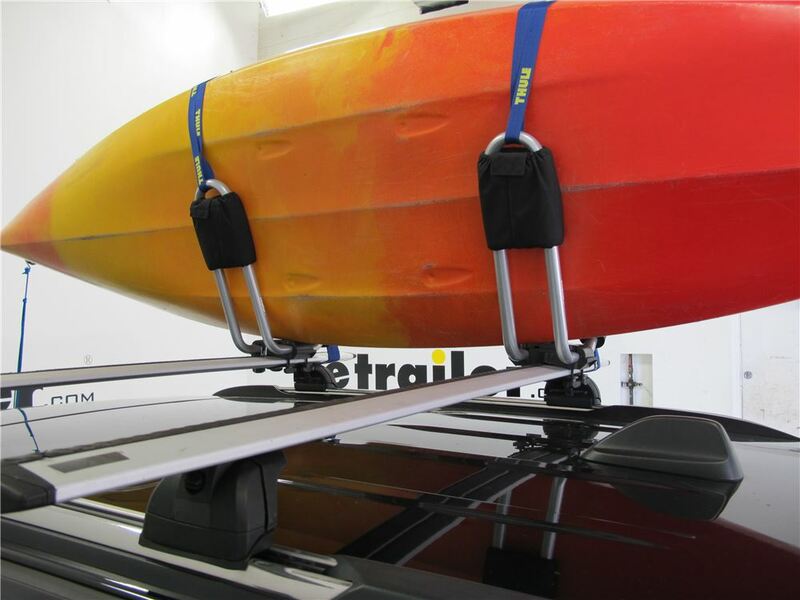 It's going to keep our kayak looking nice, and prevent it from getting scratched during transportation.Thule's done a great job also protecting the Hull-A-Port. These steel tubes here are going to be nice and sturdy, but those, as well as the mounting hardware, have the all-surface corrosion resistance protection. Since these are going to be spending a lot of time around the water and things like that, it will make sure we don't have to worry about that corrosion quite as bad as what we do on some others.Now this has been designed to fit the Aero crossbars like what we have here from Thule. If you want to use the T track slot to mount it, there is an adapter available for that. This is also going to fit on the round crossbars, square crossbars, most of your factory crossbars. 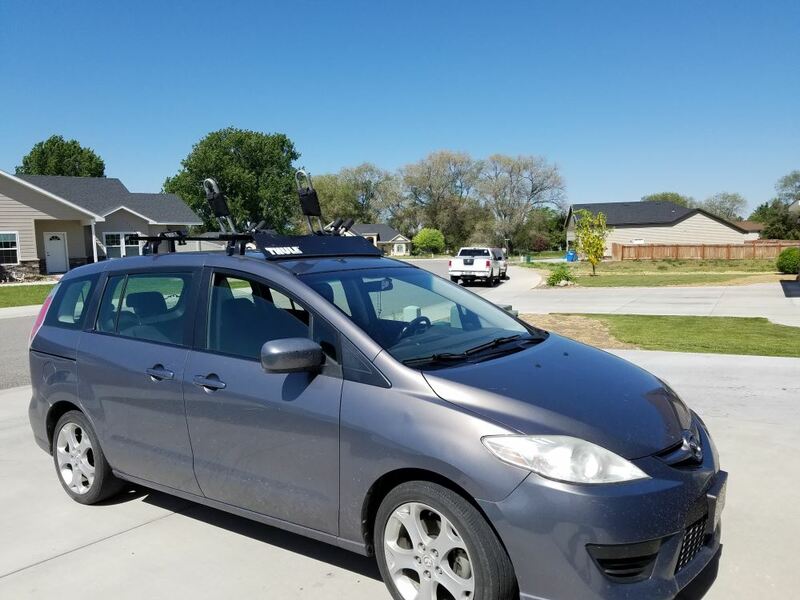 The only real fit issue we have is with the Rhino Rack Aero style crossbar. For that, the T slot adapter is going to be the way to go.Something else that's you're going to like about the system, that it's pretty easy to take on and off. 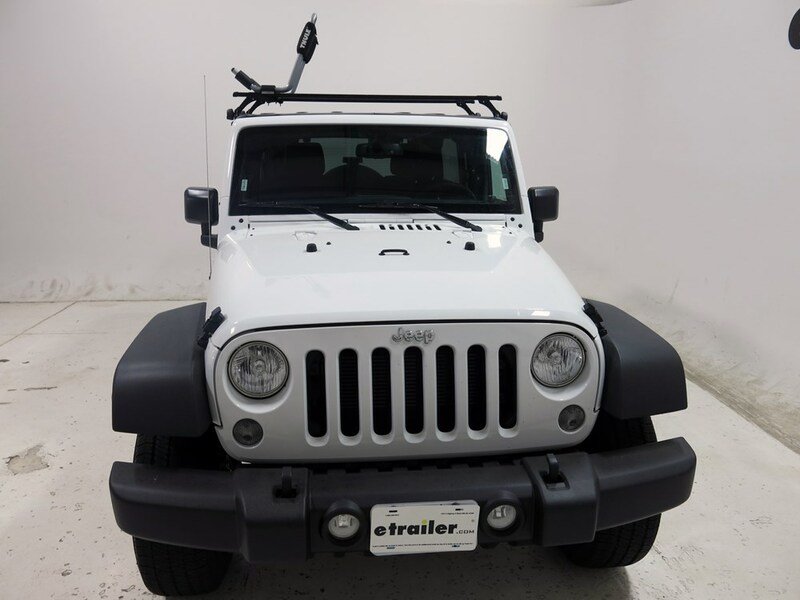 At each location we've got four knobs that you remove to take the J hook completely off the vehicle. 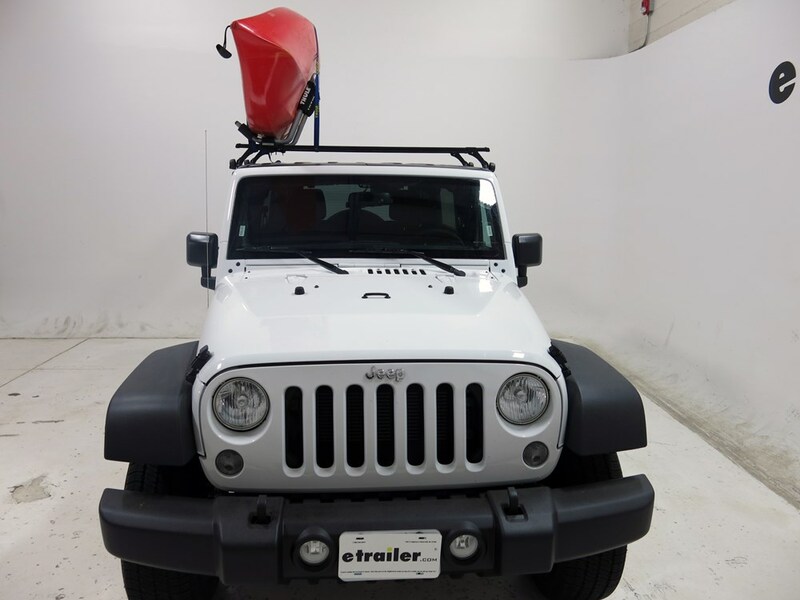 So this isn't one of those roof rack items that you're going to dread removing if you need to.The Hull-A-Port's also been designed to work with a wide variety of kayaks. The width we can go up to is all the way up to 36 inches. 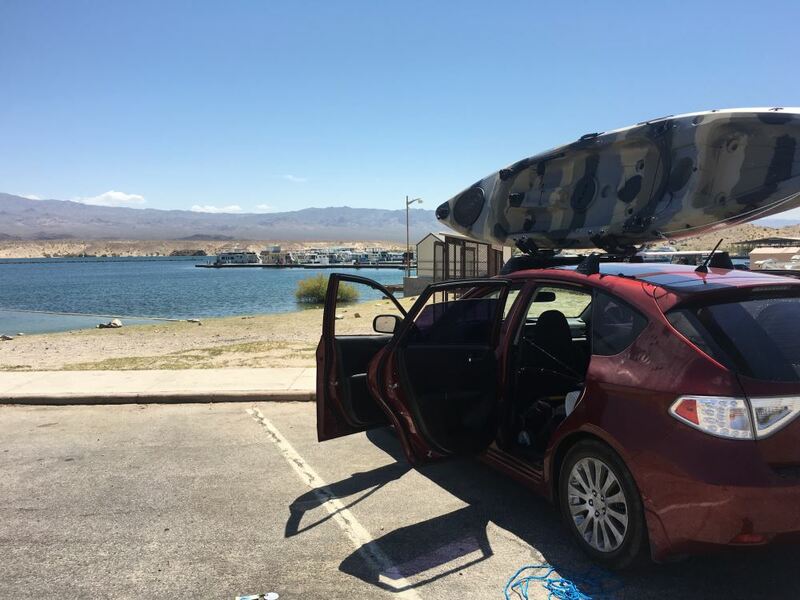 The kayaks can weigh up to 75 pounds, and it's going to work out really well whether you've got the composite style hull or the plastic.Now when comparing the Hull-A-Port to other kayak carriers, our customers typically look at something like part number S510. 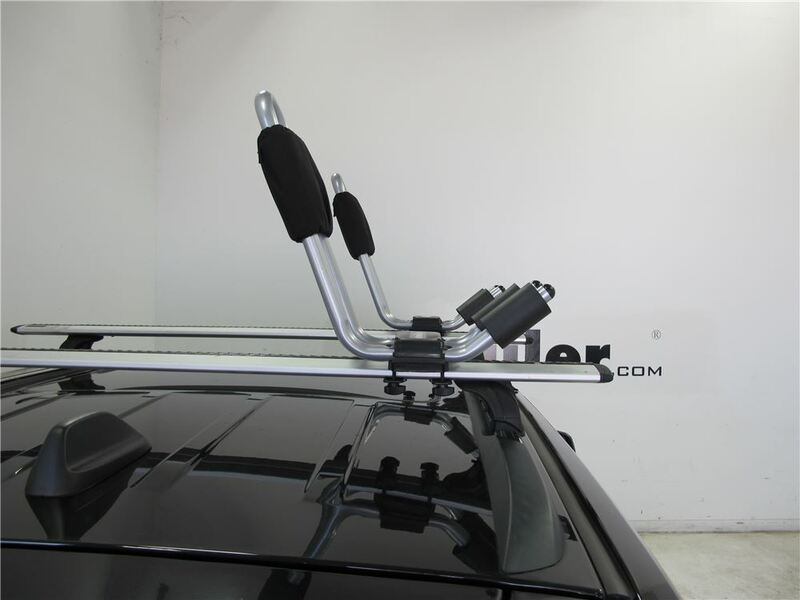 It's going to be the Rhino Rack J style kayak carrier, or something like the Thule Stacker, part number TH830. 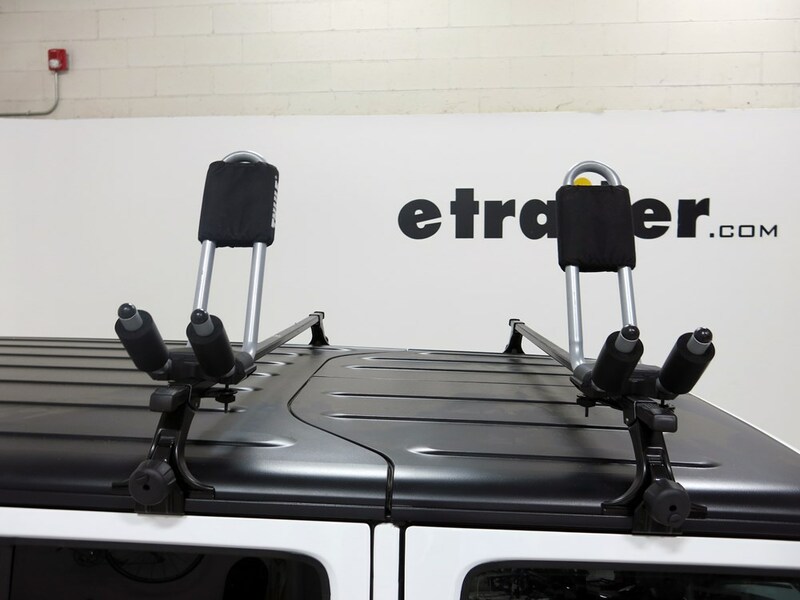 The Rhino Rack is almost identical in how it attaches to your vehicle and how it installs. 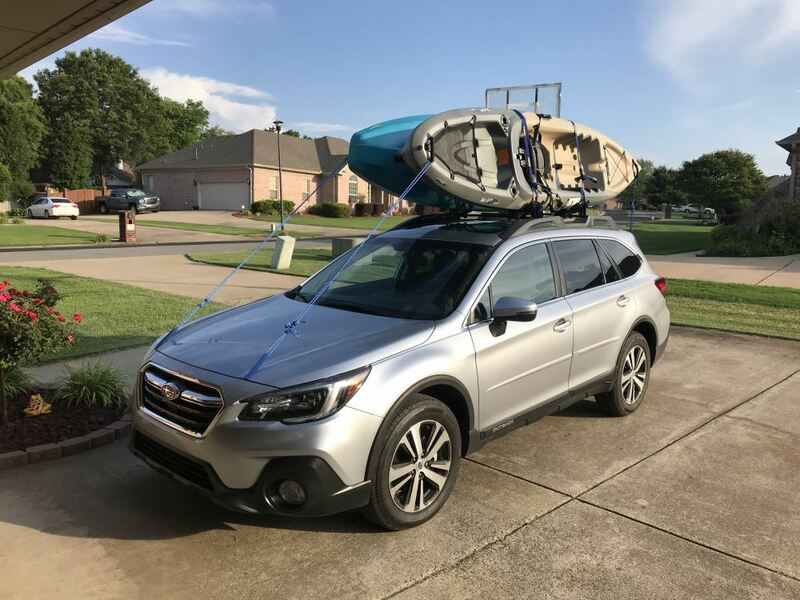 I think the Hull-A-Port is just going to offer some more padding.Now as far as the Stacker goes, it's going to give you the ability to carry additional kayaks, so you can carry two rather than just one in our Thule J hook style, although it doesn't offer the same protection as what we see in the Hull-A-Port, so if multiple kayaks are your goal, it might be a better option.Now we're going to be installing the Hull-A-Port on our Thule Aero crossbars. We're going to choose our longer bolts, and we've got four locations for these to go down through. You just want to make sure that that squared off portion of that bolt fits down into the square holes. Now we can place this on our crossbar with two of the bolts being towards the back, two to the front, and our J hook towards the outside of the vehicle. The bottom of it is contoured. That's to help us with different styles of bars so we can get it leveled out. You just want to adjust it front and back there until you have your level position. Take a look, kind of check it out front and back to make sure you've got them even.Now we can take the rubber coated metal lower portion of the clamp. It's going to go around the bottom side of our crossbar, up on those bolts that we brought through. You can see we've got our knobs there. We'll just get those threaded on. We'll just gently snug those down, leaving them just about hand tight. Take a look to make sure you have both sections in line with each other, and then we'll secure our knobs. And you can see once installed, it's going to be really nice and solid, not a lot of movement or play there.Now as we load the kayak, we want the hull portion or the bottom portion of the kayak to be facing the taller side of our hooks. Place that in. We'll rotate it so it's cradled nicely and our hull is sitting as far back against those hooks as it can. You can see here, as the kayak's resting against our pads, this one's in perfect spaced, right there to where it's making contact in the middle. 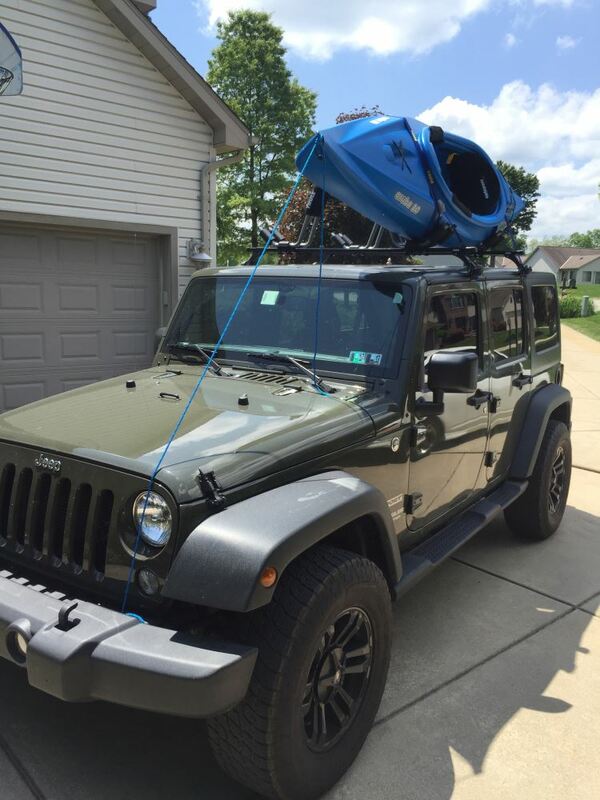 This one maybe is a little low, so we can just bring that up.Now to secure our kayak to both the J hook and crossbars, we're going to use the provided straps. There's a good amount of length here, so you're going to have plenty, and we want to go over the top of our kayak, through the top of the J hook, and then back over towards the front. We'll bring that up so our cam buckle's about midway. We're going to bring that right around the bottom of the crossbar, and then we'll feed the tag end through the back side of the cam buckle there, and we can begin to take out our slack. Now we'll pull down on the strap while we pull up on the bottom portion. We just want to make sure we get all the slack out of it here. And with that nice and secure, we can take the protective cover and bring it around that metal, giving us further protection. The excess, you'll just tidy that up.Now we want to repeat that same process for our forward hook. 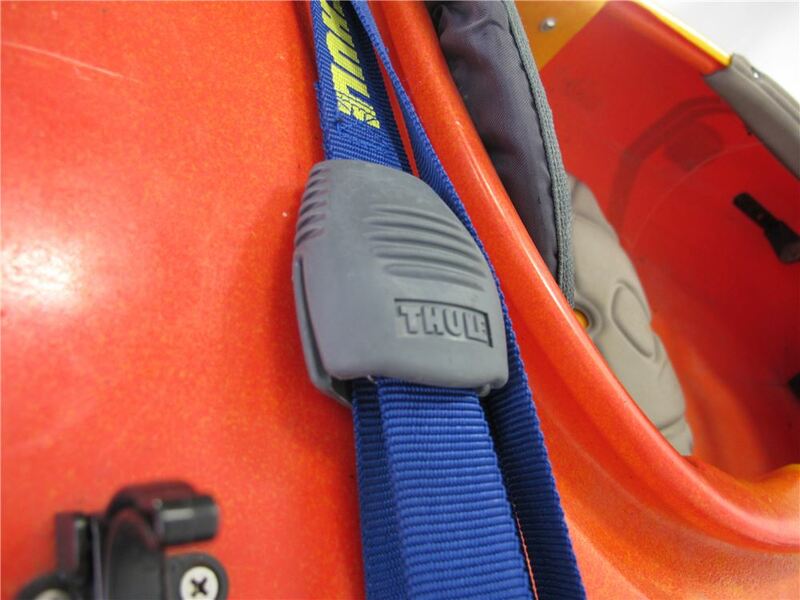 Now for added safety, Thule also includes a bow and a stern tie down. We're going to have a hook. That's going to go on the handle of the carrier, and you can see here on the rear we've just attached this to the receiver safety chain connection point. 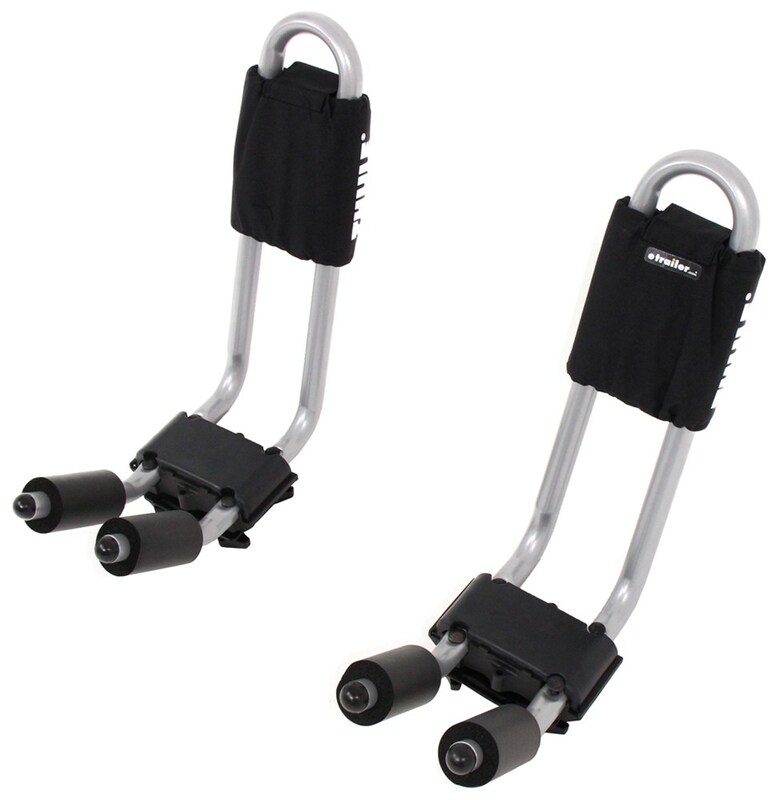 Thule also offers a quick loop attachment. This is part number TH530. It's going to come as a two pack, so you could have one for the front and the back, depending on your application. We're going to show you how to use this up on the front when we secure the bow.Now these are meant to work in any of the crease areas, so in our case we're going to be up here on the hood. I'm just going to pop that open. We're going to place that in so that when we close the hood, it's not going to be smashed. I wouldn't put it right here because then we're going to be smashing that. But we set it a little bit further in just like that. There's plenty of room for it, and we simply close, and that's going to give us a nice attachment point that we can use right here for the front.Again, we'll just bring our hook through our loop, bring that through the quick loop, and then secure. And that's going to complete our look at the Thule Hull-A-Port, part number TH834. 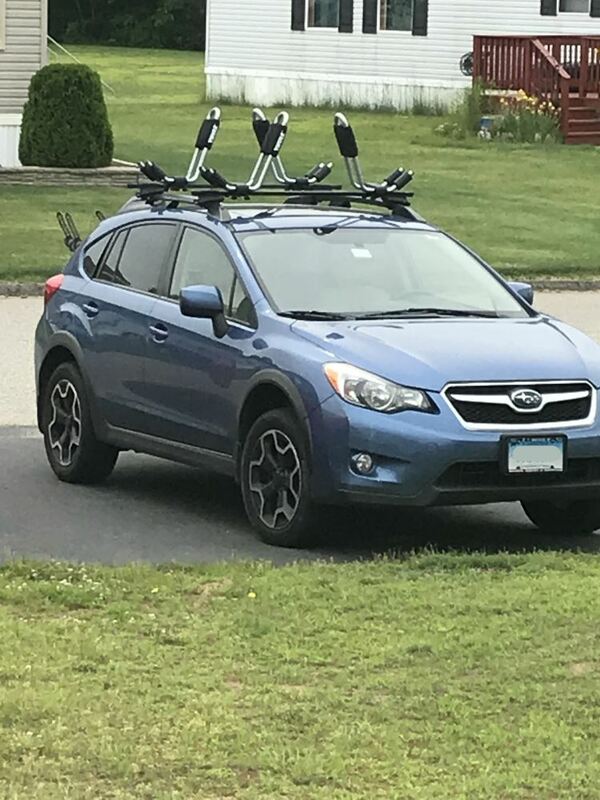 Order: RelevanceNewestRating - High to LowRating - Low to High These J-style cradles let you transport 1 kayak on its side on your roof-rack crossbars. Compact and easy to install, the design won't take up too much space on your roof. 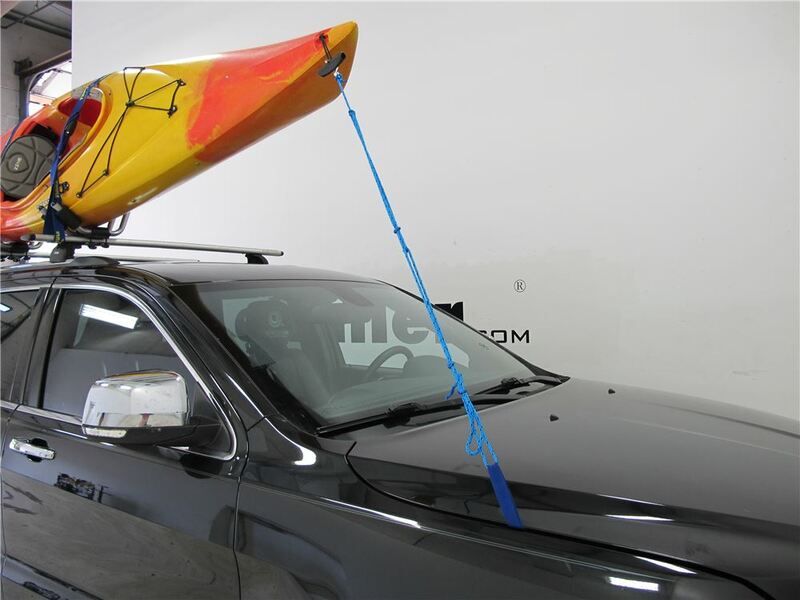 And tie-down straps are included to secure the kayak to your crossbars. 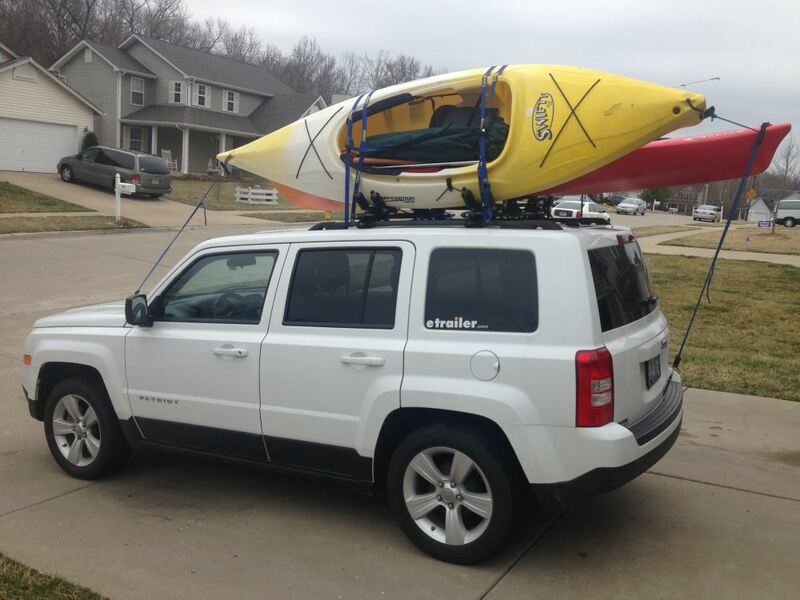 We have two kayaks so we bought another set and now we dont have to have a boat sticking out the rear window! They work great and look like new. 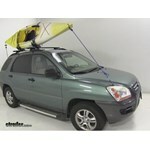 No problems what-so-ever with the rooftop carrier or the J-holders for the kayaks. I have Emotion Comets, they are approximately 8 feet 2 inches long, and about 2 feet 7 inches wide. 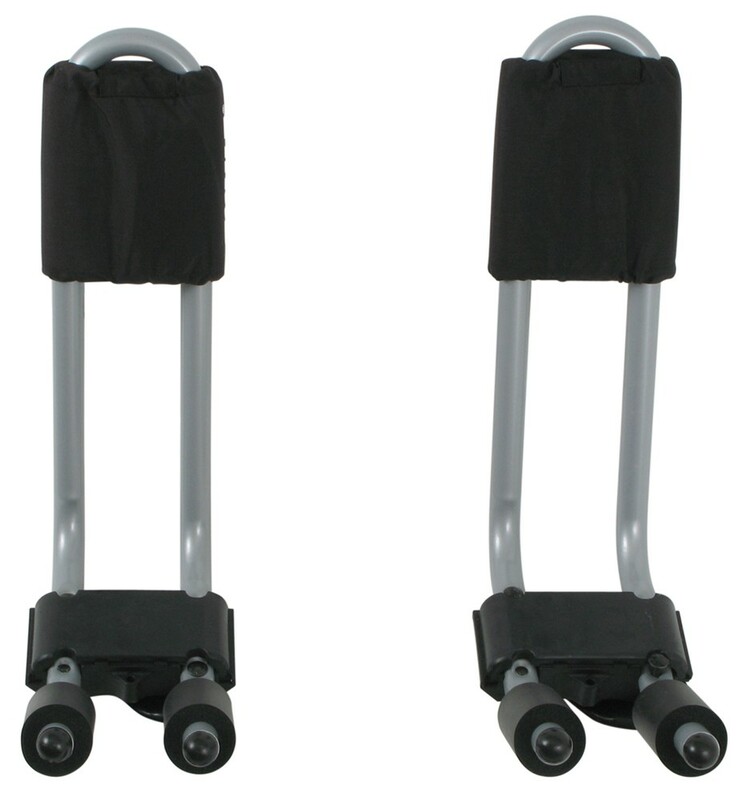 They fit very well in the carriers, and have traveled many, many miles without any problems and without coming loose. Since these Yaks are not all that long I have not used a bow and stern tie down,,, again I have not experienced any looseness or movement of the two Yaks foregoing the extra bow and stern tie downs. Do you have a question about this Watersport Carrier? 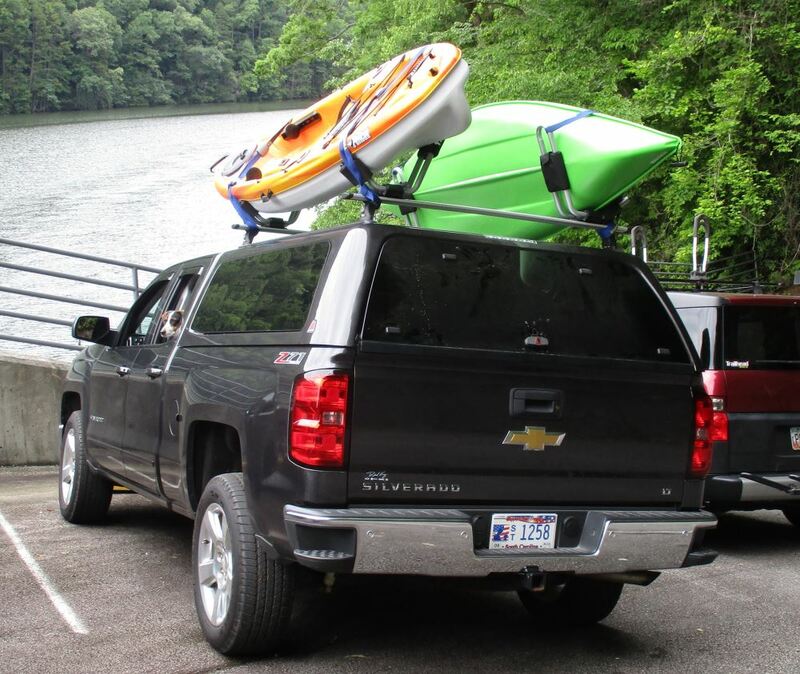 The Curt Cargo Carrier part # C18115 or the Thule Canyon Cargo Basket XT # TH859XT would be a great choice for a roof cargo basket, but if you are looking to transport kayaks you would need a kayak carrier like the Thule # TH834 as these baskets cannot transport kayaks safely. 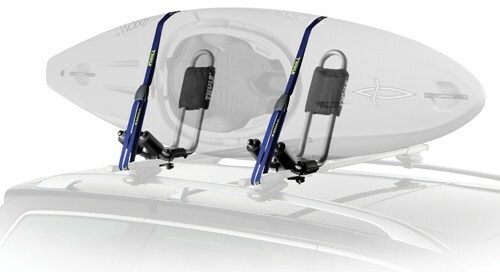 The Thule Stacker part # TH830 does have a 10 foot kayak length limit. 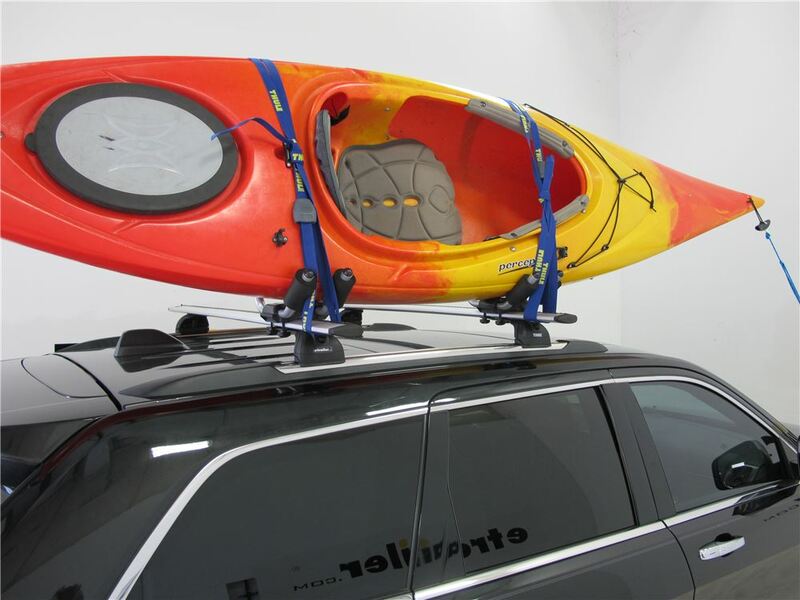 Since your kayaks are longer than that you would want to use the Thule Hull-A-Port Pro Folding J-Style Rooftop Kayak Carrier # TH834. 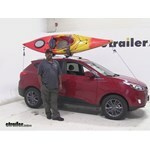 This is a great kayak carrier that would work well for you. Check out the review video I attached. 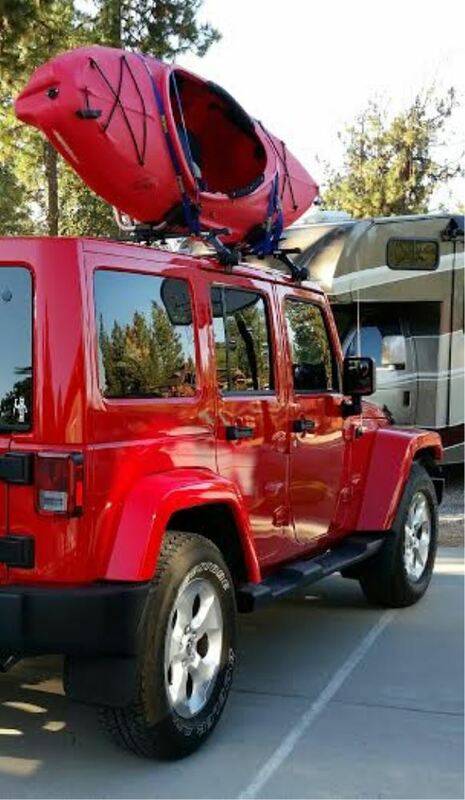 You will need to order one for each kayak you have. 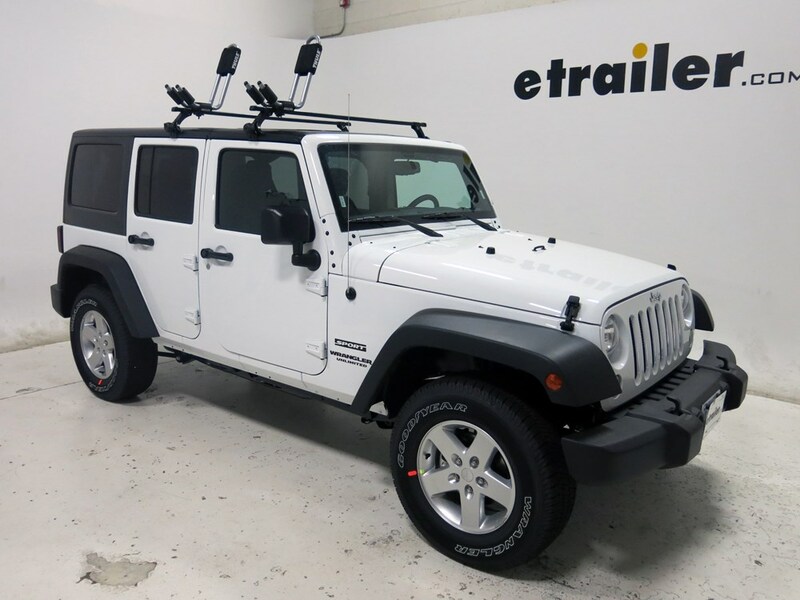 It sounds like you have the Thule Hull-A-Port, # TH834, which should fit the Yakima round bars. 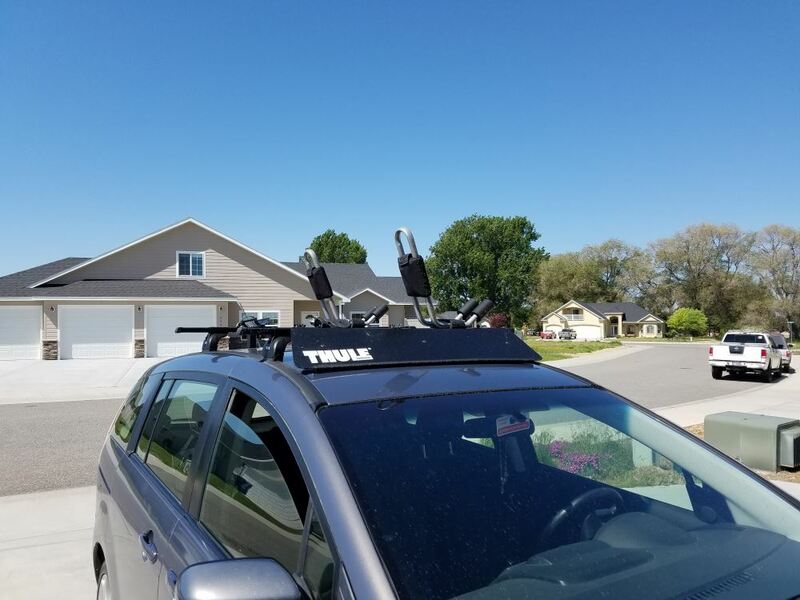 The Yakima round bars are only 1/4 inch taller than the Thule bars. But if it is not working then you would need longer bolts. The Hull-A-Port originally came with a set of 50mm bolts and a set of 65mm bolts. But you can use the 75mm M6 bolt, # TH915-0675-11. These bolts are sold in quantities of 1. Or if you wanted the M6 x 65mm bolts use # 915-066-554, also sold in quantities of 1. Notes: Kit has light install marks on the lower mounting brackets, otherwise it is new and unused. 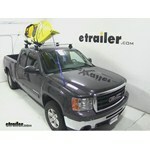 Highest quality watersport carriers for the best price. Most detailed, accurate watersport carrier information available.